There are 33 trucks for 32 spots, following the withdrawal of the #74 from Mike Harmon Racing earlier in the week. One truck will miss the show. Korbin Forrister and the #7 team are back in action for the first time since Kentucky, aiming for their seventh start of the season. Forrister last ran this race in 2015, when he finished 22nd for owner Christopher Long. These six teams have engaged in a game of musical chairs at Michigan that left one driver standing. John Hunter Nemechek returns to his own #8 Chevrolet this week while his father Joe moves to the second NEMCO entry, #87. Joe Nemechek displaces Timmy Hill, who moves to the #63 in place of Bayley Currey. Currey goes to the #83 in place of Todd Peck at Copp Motorsports. Peck goes to the #15 of Premium Motorsports, replacing Reed Sorenson. And Sorenson will slide to the #50 Chevrolet for Beaver Motorsports, taking the place of Ray Ciccarelli. After all these moves, Ciccarelli is not racing this weekend. David Gilliland’s team returns to a two-truck operation for the first time since Eldora. Bo LeMastus moves from the #54 to the returning #17. In LeMastus’ place in the #54 is Matt Mills, who will run his first Truck Series race since last September in Las Vegas. Mills, who previously drove JD Motorsports’ #15 Chevrolet in the XFINITY Series, has never before run the Truck Series race at Michigan. Mills carries sponsorship from J.F. Electric. Tate Fogelman returns for his third Truck Series start, taking the place of Tanner Thorson in the #20 Chevrolet. B.J. McLeod, who ran Mike Harmon’s truck at Pocono, aims for double-duty in Michigan as he replaces J.J. Yeley in the second Reaume Brothers truck. McLeod will also rejoin the #51 Chevrolet team for Rick Ware Racing in the Cup event (see below). Spencer Davis will run his fifth Truck Series race of the season and his first since Texas, taking the place of team owner Kyle Busch. Mike Harmon’s Truck Series team withdrew earlier this week without a listed driver. As mentioned above, B.J. McLeod drove the #74 Chevrolet at Pocono. Harmon will instead focus on the XFINITY race in Mid-Ohio, where Stephen Leicht will look to rebound from being the lone DNQ at Watkins Glen. There are exactly 40 entrants for 40 spots. Brendan Gaughan, who has an XFINITY Series win at Road America, rejoins the RCR effort, taking the place of Austin Dillon with sponsorship from South Point Hotel & Casino and Beard Oil, Gaughan’s backers for his part-time effort in Cup driving the #62. It will be Gaughan’s first XFINITY Series start since last fall’s Homestead finale, when he finished 13th. Gaughan ran 7th in this race last year. Cody Ware is set to make his first XFINITY Series start since Bristol this past spring, when he drove for Mike Harmon’s team, and his first attempt since Dover, when he was swapped out following an incident in practice. Ware takes the place of Scott Heckert, who ran the #8 Chevrolet at The Glen. Tommy Joe Martins remains in the #78, but as reported here, his Toyota the team planned to run on Saturday was totaled in Turn 6. Martins will instead run a Chevrolet. 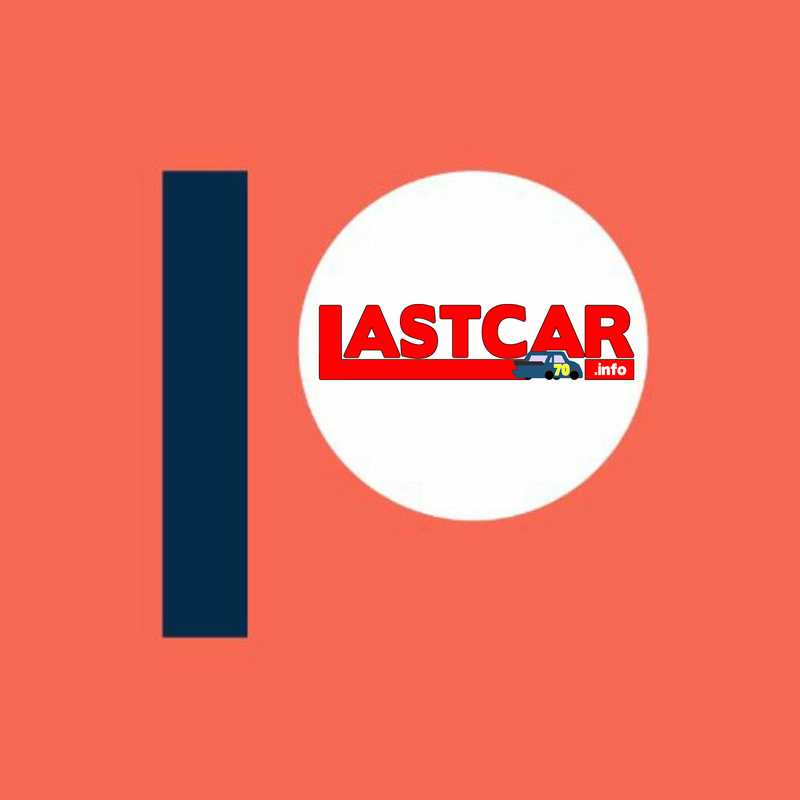 Neither Brad Keselowski nor Penske’s #12 team are entered this week following a 10th-place finish at Watkins Glen. Carl Long withdrew prior to last week’s race in Watkins Glen, but the #13 is entered once more for Saturday, this time with John Jackson driving. The car will be a Dodge in place of the scheduled Toyota from last week. Jackson eyes only his second XFINITY start of the year, following a 36th-place run at Chicagoland. Welcome to NASCAR open-wheel and sports car driver Katherine Legge, who takes Mike Skeen’s place in JD Motorsports’ #15 Chevrolet. This past May at the Mid-Ohio course, Legge and co-driver Alvaro Parente finished 2nd in GTD competition driving an Acura for Michael Shank Racing with Curb-Agajanian. Neither Niece Motorsports, nor driver Victor Gonzalez, Jr., are entered this week after the Chevrolet finished 31st at Watkins Glen. Kyle Benjamin once again swaps in for Ryan Preece in the Gibbs #18, this time sponsored by Toyota Service Centers and Mobil 1. It will be Benjamin’s first series start at Mid-Ohio. Austin Cindric moves from the #60 to take place of Joey Logano in the flagship #22 Ford for Penske Racing sponsored by PPG. Chase Briscoe takes Cindric’s place in the #60. Both drivers will be running this event for the very first time. It was a big weekend for GMS Racing at Watkins Glen as A.J. Allmendinger finished runner-up in the XFINITY race and Spencer Gallagher made his Cup Series debut the next day. This week, Gallagher takes Allmendinger’s place in his #23 Allegiant Chevrolet. At the same time, GMS Racing has scaled back to one car this week, following Justin Haley’s crash in the Esses at Watkins Glen. Justin Marks is set to make his first XFINITY start since last summer at Road America, where he finished 4th. The 2016 winner of this race ran 9th in this event last year, and is no doubt excited at the potential for another rainy race day. 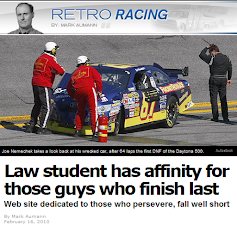 Marks takes the place of Kyle Larson, who ran at Watkins Glen. After David Levine’s XFINITY effort at The Glen was withdrawn, the car returns with two-time IMSA champion Dylan Murcott driving in his first-ever NASCAR race. According to JP Motorsports’ press release, Murcott, like Legge, ran Mid-Ohio most recently in May, his during the Lamborghini Super Trofeo Championship. Josh Bilicki remains as his teammate in the #45. With Timmy Hill attempting double-duty in Michigan between Cup and Trucks, Tim Cowen drives in Hill’s place in the #66, bringing with him sponsorship from Cowen Logistics. Like Justin Marks, Cowen only ran Mid-Ohio and Road America in last year’s XFINITY Series, finishing 20th in the former and 36th in the latter. Morgan Shepherd withdrew from Watkins Glen for the third-straight year, but returns to action at Mid-Ohio, where he trailed last year. Three of Andy Lally’s four most recent XFINITY starts have come on the Mid-Ohio course, most recently yielding a series-best 5th-place finish in this race last year for SS-Green Light Racing. This year, Lally rejoins Mario Gosselin’s team, with which he ran a strong 7th in the rainy 2016 running. Taking the place of Brian Henderson, Lally carries sponsorship from Amethyst Beverage and Aase Sales. 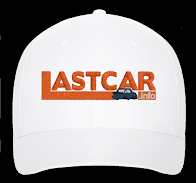 Lally tweeted on July 24 that he will also run Road America, where Henry Repeating Arms will back his orange Chevrolet. Neither Aric Almirola nor the #98 team are entered in this Saturday’s road course race. There are exactly 40 drivers entered for 40 spots, the first time since Pocono two rounds ago, and only the sixth time in 23 races in 2018. Matt Kenseth had a rough day on the road course in Watkins Glen, and Trevor Bayne now steps back into the #6 this week with returning sponsorship from Advocare Rehydrate. In 14 previous Michigan starts, Bayne’s best finish was this race last year, when he finished 5th. Garrett Smithley brings his sponsorship from Victory Lane Quick Oil Change from StarCom’s #99 to the #7 team, which rejoins the circuit for the first time since Jesse Little’s Cup debut at Kentucky. The car carries a black scheme instead of the white car he ran at StarCom. Blake Jones returns in place of Spencer Gallagher, who made his Cup debut at The Glen. 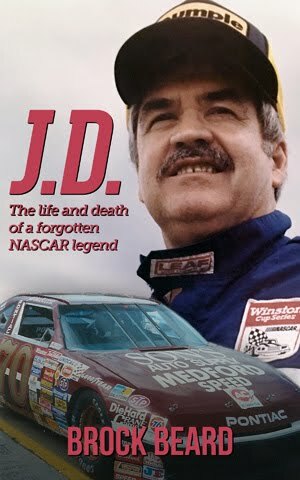 We last saw Jones in the series at Loudon, where he ran 33rd in his own series debut. Tennessee Shine Company returns as the team’s sponsor on the black #23 Toyota. B.J. McLeod rejoins Rick Ware Racing for the first time since Pocono, taking the place of Josh Bilicki, who had electrical issues at Watkins Glen. Bilicki will not run at Michigan, and instead focus on the XFINITY race in Mid-Ohio (see above). Timmy Hill tweeted that, as at Pocono two rounds ago, he will have a brand-new vibrant paint scheme from sponsor Rewards.com. Hill will make his 10th Cup start of the season and his fourth in the series at Michigan, where his best run was a 29th for Go FAS Racing in 2013. Corey LaJoie swaps back in for Cole Whitt, who was on road racing duty in Watkins Glen. LaJoie’s best of three Michigan starts in Cup came this past June, when he ran 27th for the TriStar team. Schluter Systems returns as primary sponsor for the effort. Jeffrey Earnhardt takes the place of Parker Kligerman with returning sponsors from Xtreme Concepts, Inc. and Project K9 Hero. News broke during the week that Earnhardt will drive this car for the rest of 2018. Earnhardt’s four prior Cup starts at Michigan are a pair of 37th-place runs, followed by a pair of 35ths. StarCom brings back their second car with Gray Gaulding driving it for the first time. StarCom Fiber will back the car. It will be Gaulding’s 18th start of the season and his first since Chicagoland, when he last drove for BK Racing. Gaulding’s run this past June, where he finished 31st, is his only previous Cup start at Michigan. 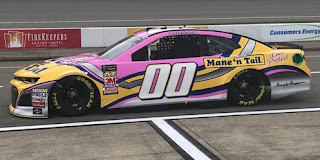 Longtime Derrike Cope sponsor Mane ‘n Tail has signed with Landon Cassill for this weekend’s race, continuing a partnership that began when Cope joined Bobby Allison’s Cup team at Watkins Glen on August 14, 1994. Cope finished last that day with engine woes, sweeping the road courses that year. The Mustang was revealed earlier this week as the new model for Ford’s Cup Series effort in 2019. While the Camaro has had a single last-place finish in 1971, as distinguished from other Chevrolets in the same race, the Mustang has not in races where it’s competed against other Fords. However, the Ford T-Bird trailed seven races between 1959 and 1961 when the model ran against other Ford models. The last of these occurred in Sacramento, California on September 10, 1961. Scott Cain’s #12N 1960 T-Bird busted the crankshaft after just two laps around the one-mile California State Fairgrounds. Eddie Gray took the win in a 1961 Ford.